Have we hit gold’s, silver’s and pgms’ bottoms yet? Elliott Wave Analysis: No Coincidence Gold Traded into July Low then Begins Uptrend.. I have to admit that personally I find some technical analysis of metal and other price trends somewhat difficult to fully understand – and some of the terminology used to express price patterns is foreign to me . But there is no doubt that such technical analysis has a significant part to play in trying to understand where metal prices are headed – and Elliott Wave analysis has certainly proven itself a great predictor in the past. 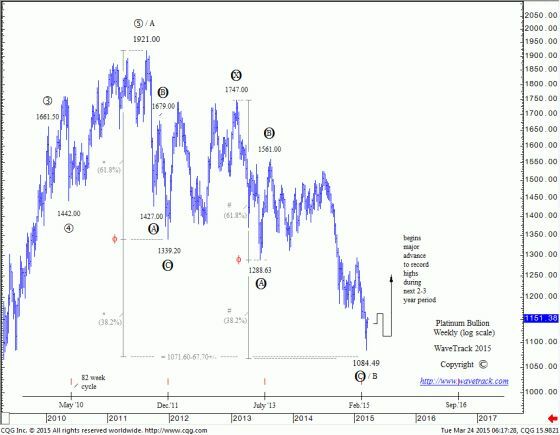 Thus readers of LawrieOnGold may be interested in the latest analysis and charts from Elliott Wave analyst Peter Goodburn of Wavetrack International who believes the charts show that a major uptrend in the platinum price has commenced. For those who fully understand the terminology, here follows a lightly edited report from Wavetrack International setting out this position. Overall the WaveTrack analysis suggests very strong positive price movements ahead for all the precious metals and also for base metals. Given the strong correlation seen between crude oil and platinum, a strong surge in the latter would suggest a similar performance in the former – very much a contrarian viewpoint to those who see crude oil’s price malaise as continuing into the medium and long term. Platinum’s decline from its Aug.’11 high of 1921.00 has unfolded into a counter-trend pattern defined by its overlapping sequence unfolding into seven main price-swings. Specifically, this has taken the form of an Elliott Wave double zig zag pattern labelled A-B-C-X-A-B-C. There is significant evidence that indicates this pattern ended late last week when the US$ dollar traded to a new high at 1084.49 – see fig #1. This can be ‘proofed’ from two ‘double-phi golden-ratio’ measurements – extending the first sequence (zig zag) to 1339.20 by a fib. 61.8% ratio projects a downside conclusion to 1071.60 – second, extending wave A within the secondary sequence (zig zag) to 1288.63 by a fib. 61.8% ratio projects downside targets for a conclusion of the pattern to 1067.70+/-. Prices were ‘attracted’ to this resonance with a recorded low at 1084.49 – close enough and verified as ending the entire pattern basis a sharp ‘price-rejection’ that has since pulled prices higher to 1151.00. This tells us that platinum is set to join many other commodities in launching itself significantly higher during the next few years, with ultimate upside targets to new record highs – in this case, above 2304.00, the previous record set in March 2008. The ‘pattern signature’ is not unlike Copper and many other industrial commodities – all in this sector are set to begin new major uptrends. There is much discussed about Crude/Brent Oil these days given its sharp declines during the last year. Most analysts remain side-lined with the most optimistic forecasts predicting only modest rises because of huge global stockpiles. 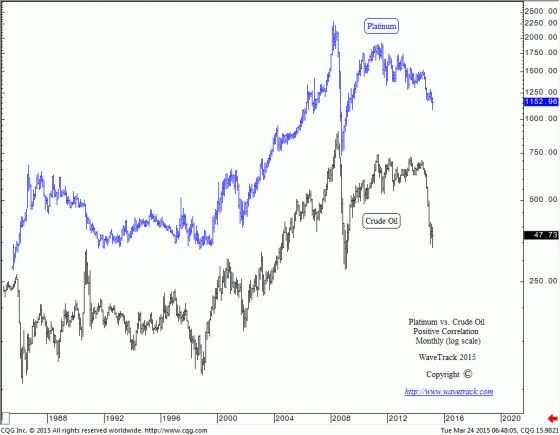 But the Elliott Wave Principle (EWP) is telling a completely different story – it confirms Crude Oil will soon launch itself higher along with other commodities.